Enjoy our services while checking quality in a sustainable environment. "In nature nothing is created, nothing is lost, everything is transformed." 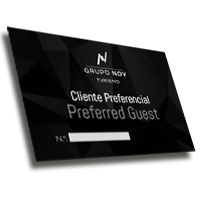 Since 2006, the Grupo NOV Turismo takes Quality and Environment Management as a synonym for Trust and Added Value in all units that comprise with this project. The focus on the procedures standardization in all hotels in Lena Tourism Group, ensures that the procedures meet the Quality Service requirements, bearing in mind the importance of their role in relation to the customers’ expectations and satisfaction. We intend to develop a relationship with our customers, with the aim of encouraging their return, so therefore we closely follow their views, suggestions and satisfaction, and all of those that make the services provision possible. The Eurosol Hotels understand Environment Quality and management as a synonym for Trust and Added Value, promoting not only a differentiable and competitivea dvantage in today's market, but also higher performance levels. Continuouly IMPROVE Quality Management System, competitiveness, productivity and performance levels, while taking preventive actions regarding situations that are subject to adjustment and improvement. IDENTIFY and CONTROL the significant environment aspects and impacts of all of our activities through the recycling of produced residues and their adequate management as well as the reduction of resource consumption. ASSURE high level of professionalism and competence of our team by providing them the necessary sensibility and environmental awareness and knowledge of the best practices and actions. We favor the commitment and the engagement of all in improving a relationship of excellence with our stakeholders. DUTY to carry out all the legal and applicable requirements to the activities and services provided. Eurosol Hotels promote its environment and quality policy with their employees, business partners, clients and the community in general assuring their fulfilment. Place the newspapers and magazines on the table, don’t throw it into the garbage bin. Throw food waste and dirty packages into the bathrooms’ rubbish bin. Turn off the tap when you are not using it. At the end of your shower, please wait 5 or 6 seconds before using the towels, to reduce the extra water. That will allow a maximization of the towels use. Turn off the lights every time you live a room. Follow the card “Towels exchange” instructions that you will find in your bathroom. We want to improve and increase collaboration with partners with relevant activities in the community. We participate in several campaigns supporting charities institutions by delivering food, clothes, toys, and other goods. Customers can appeal to Alternative Dispute Resolution entities which name, contacts and website addresses are in the list of the entities near by the ‘Consumers Direction’.